The Racebets Jackpot Freeroll competition is a great way to earn some big money through your horseracing predictions and it is completely free to play! Here you can find our daily predictions. Betandskill's tipsters are renowned as the best horse racing tipsters of the Internet. 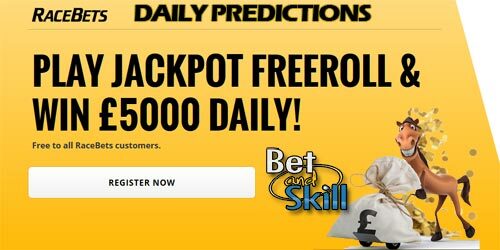 Play Racebets Jackpot Freeroll with our predictions and get £5000 every day! The jackpot will be shared if there is more than one winner. It's FREE to play Racebets Jackpot Freeroll!Racebets Jackpot Freeroll is a daily "free to entry" competition for every customer that has registered and deposited a minimum of £10 at any time. You will not need to deposit ever again to play the Jackpot Freeroll, after that. Racebets will also match your first deposit with bonus cash (up to a maximum of £50). There are more details about how the Racebets Jackpot Freeroll works here, but the basics are that you need to correctly predict the winning horse of every selected race in order to win the jackpot. Open a new Racebets account via this special link! "Racebets Jackpot Freeroll Predictions and Daily Tips"